The third film in the family franchise is coming to Blu-ray in March. 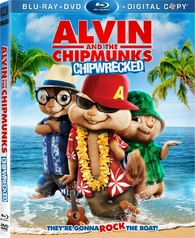 In an early announcement to retailers, 20th Century Fox will be releasing 'Alvin and the Chipmunks: Chipwrecked' on Blu-ray on March 27. The Chipmunks, Chipettes, and their caretaker Dave Seville (Jason Lee, "My Name is Earl") embark on the trip of a lifetime aboard the Carnival Dream cruise ship. Seeking fun and excitement, the Chipmunks turn the luxury cruise liner into their own personal playground. But the ultimate vacation quickly becomes a disaster when the Chipmunks, Dave, and the Carnival cruise pelican mascot - who turns out to be the chipmunks' old manager, Ian Hawke (David Cross, 'Megamind') - accidentally fall overboard and find themselves 'chipwrecked' on a remote island. Stuck in an unfamiliar territory, the six furry castaways are separated from Dave and must figure out a way to survive on their own for the first time in their lives. The Blu-ray will feature 1080p video, a DTS-HD Master Audio 5.1 soundtrack, and supplements will include: Munk Music & Dance Machine segments, Four behind-the-scenes featurettes, Music videos & sing-a-longs, Two Fox Movie Channel featurettes, Extended Scenes, Promotional featurettes, and Theatrical Trailers. Exclusive to the Blu-ray will be Chipwrecked: Coloring with Chipmunks. The release will also include a DVD and digital copy. Suggested list price for the Blu-ray is $39.99. You can find the latest specs for 'Alvin and the Chipmunks: Chipwrecked' linked from our Blu-ray Release Schedule, where it's indexed under March 27.